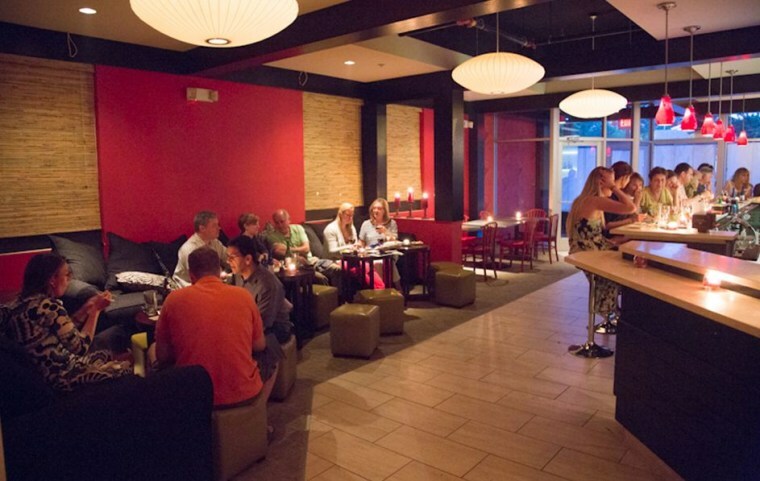 Sidewalks in the hip neighborhood of Del Ray in Alexandria, Va., are often clogged with baby strollers and young parents—but that hasn’t stopped one new sushi restaurant from banning the 18-and-under crowd. Surprisingly enough, The Sushi Bar, which officially opens Tuesday, is owned by the same person who runs the two super kid-friendly restaurants that flank it: Pork Barrel BBQ and Holy Cow, a burger joint where you might find 20 kids running amuck on a Friday night. “We thought, ‘These poor parents—they’re helicopter parents, God love ’em—they’re always doing this and that with their kids, and we thought, they need a break.’ Not so much a break from their kids, but adjoining kids, ” said owner Mike Anderson, who has three kids himself—only two of whom are old enough to dine at the new restaurant. The Sushi Bar itself is set up more like a lounge than a traditional restaurant and features a sake bar. “We thought it might be nice to have a place where young parents can come down and reconnect,” he told TODAY.com. The no-kids policy has already caused a barrage of local press and heated comments online, but Anderson says he’s shocked at the publicity. The Sushi bar isn't the first restaurant to cause controversy by banning kids, though other restaurants that have done so usually just ban young kids. Anderson owns another restaurant, Mango’s, in Bethany Beach, Del., which often has 50 or 60 kids at a time in the dining room; he estimates 50 percent of them are well-behaved, 25 percent are “borderline” and the last 25 percent are, well, not so well-behaved. “Some parents take the attitude that they’re in the door, so they take the leash off,” he said. Ironically, Urbanspoon released its list of America’s Most Popular Family-Friendly Restaurants on Tuesday as well, so if you’re looking for a place to bring the kids to on road trips this summer, don’t fear, there are 100 spots on the list, all judged by critics’ and diners’ reviews as well as family-friendliness. Sure, the list includes some ice cream places and hot-dog joints, but it also features some surprisingly kid-friendly gems, like Piatti in La Jolla, Calif., a cozy, elegant Italian restaurant with proper stemware and white tablecloths. Piatti offers a kids’ menu with healthful fare like a small portion of salad for $4 or a chicken breast with broccoli, plus a scoop of gelato for dessert for $9. And yes, there are crayons—the restaurant even displays the kids’ artwork. Spano adds that he can remember having to ask parents to do something about a screaming child only two or three times in his 20-plus years on the job. “I do feel like some people have forgotten about restaurant manners and etiquette, but for the most part, it’s not an issue,” he said. Banning kids would all but destroy business for chef John Rivers, owner of 4 Rivers Smokehouse, a small group of barbecue restaurants whose suburban Orlando location made the Urbanspoon list. As for The Sushi Bar, Anderson says he is talking about turning the tables and holding a no-parents day, where kids can come in for sushi-rolling workshops and chopstick lessons with the chefs. But for the most part, he is sticking by his no-kids policy.